Development of your idea is a careful process. It is treated like a baby, as it should. You must accept, that no matter what, it will never be perfect. By taking the time to make it perfect, you miss opportunity, waste time and money. If you don’t have an open mind to this, stop reading now, send us 49% of your money and you keep the other 51%, that way we both get something. If you are really ready to open the door to possible success, then recognize it is a set of stairs to climb, there is no elevator. It is work. Some of the work is of the physical nature, stuff you do; code, mockups, user testing, etc. What is more important is the mental effort to listen, lead and critical – adapt. It is so important, it needs to be said thrice….adapt, adapt, adapt. Without this, it is almost certain business death. Whoa now..a little much talk about death, you say? Let’s talk about survival and then life. Now that you have your approach oriented, you’ll experience something unique to software development. Your product will be end up different than you ever though it would. Like a teenager after 13 years of raising it, you ask, who is this person? It is by far, the best analogy. Your product will be used like a rented mule (who rents mules?) and tested, you’ll get feedback, more than you want really. People will tell you about fonts, the dreaded ‘I don’t get it’, graphics, buttons, oh my. Be sure to listen there are gems in there, for real. Now adapt some of the stuff (not all), make the changes or add the features that match the demand. NOT what YOU think is needed, but what was actually shared with you from your user feedback. 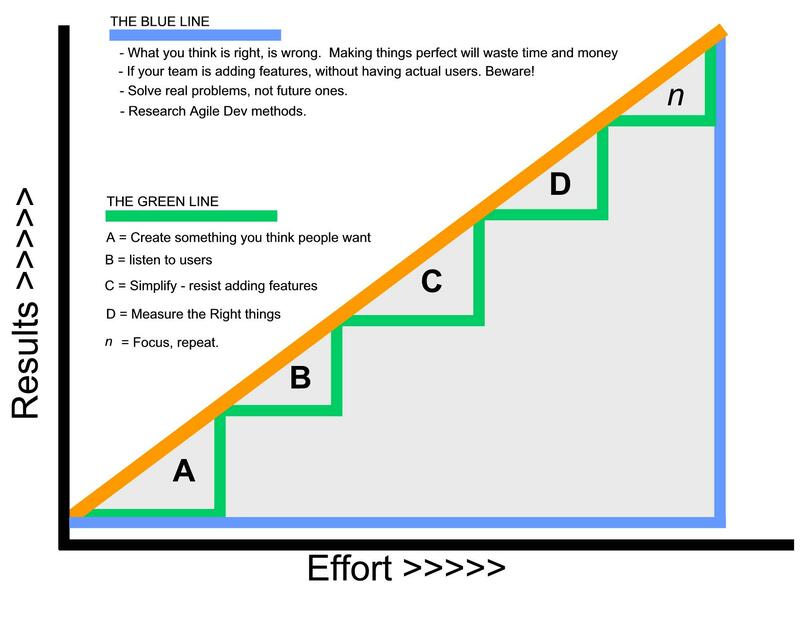 Then measure, then listen, than adapt, then measure…rinse, repeat if necessary. Always assume it is necessary. Even when you are beyond survival thinking. Enjoy.